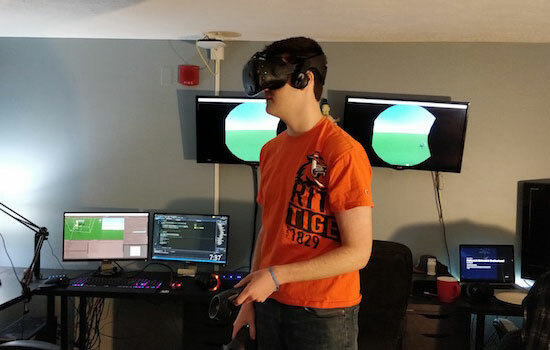 William Montgomery, a game design and development major, tests out the virtual reality on a video game he is creating with a team of RIT students. The group will display the game, called Project Colossus, at Imagine RIT April 28. Compete against friends as either a virtual reality robot or as resistance fighters at the Imagine RIT: Innovation and Creativity Festival on April 28. An interdisciplinary team of students will showcase Project Colossus, a video game they are creating in class that mixes virtual reality with traditional controller-based gameplay. The hands-on exhibit, located in the Computer Zone in Golisano Hall, room 2000, will allow festivalgoers to put on a virtual reality headset and play the game as the colossus robot or with a controller as a resistance solider. In the video game, robots have taken over the Earth, but a resistance group is planning to attack. Soldiers storm a factory to destroy the half-built robot colossus that can rotate and throw broken parts at the resistance fighters. Hazen also noted that they are adding laser eyes to the robot colossus. Students are creating the game a collaboration between the game design and development major’s Production Studio course and the 3D digital design program’s Collaborative Project course. While the 3D modelers create the broken robot parts and scaffolding for soldiers to climb, the game developers are designing the mechanics of each character. Together, the team must create a working prototype to present as their final project. The game is being created by Hazen; William Montgomery, a third-year game-design and development major from Newtown, Conn.; Sanketh Bhat, a third-year game-design and development major from India; Jared White, a third-year game-design and development major from Boyds, Md. ; Abby Hurd, a second-year 3D digital design major from Hardwick, Mass. 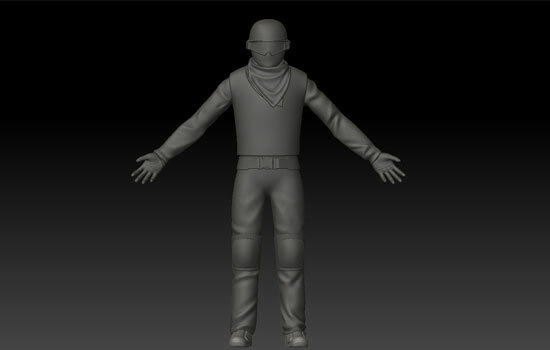 ; and Dylan Lobbregt, a third-year 3D digital design major from Milford, Pa.
A 3D model of a resistance fighter from the student-created video game Project Colossus. In the game, players will control a colossus robot using VR, all in hopes of defeating the resistance fighters.